While cleaning out a basement closet, my husband ran across a doll case. Inside were 2 Indian Figure Dolls. I was able to identify 1 as a Skookum Bully Good Indian Doll. But then I cannot find any identifying marks on the other one. It is dressed in real leather and fur clothing and boots. 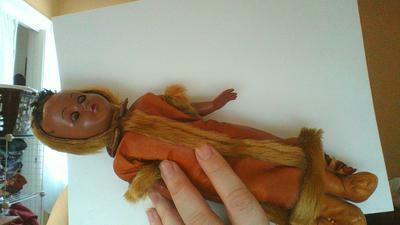 She stands about 10" tall and wears a leather hood with fur trim. I think the fur may be a squirrel. Her arms, legs, and head are moveable and her eyes open and close. I was able to easily pull the hood back from her head but did not find any manufacturing marks on the back of the head (where you would think they would be). I do not want to remove the boots or dress as they appear to have been stitched in place.